So I thought it was time to take stock of my growing Vampire Counts army and give them their own plog. Especially considering how old my general one is and how clustered it is. As the title suggested I am going for A Lahmian army, so some stunningly beautiful and dangerously ambitious female vampires at the head of this Khemri style army of the undead. 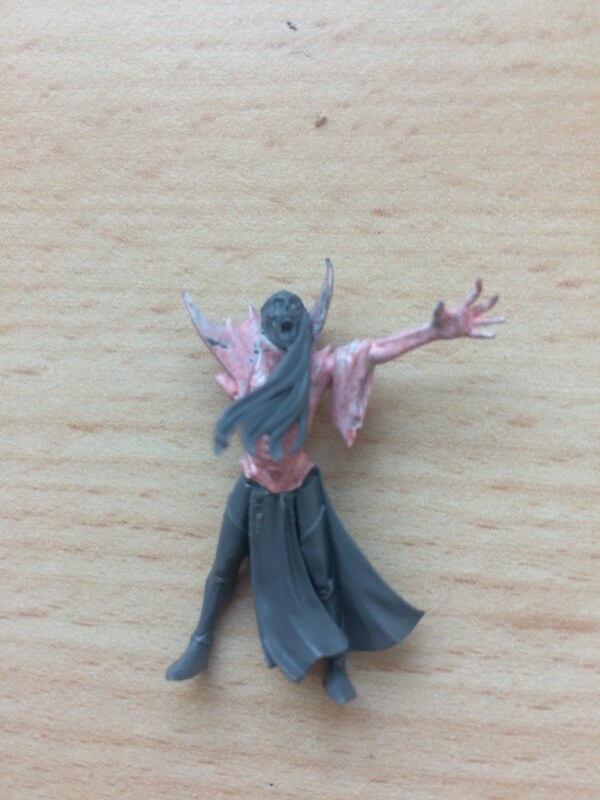 I plan to introduce some tomb kings elements into my force, mixing it with the more traditional vampire counts models, let’s hope eBay will be kind to me. 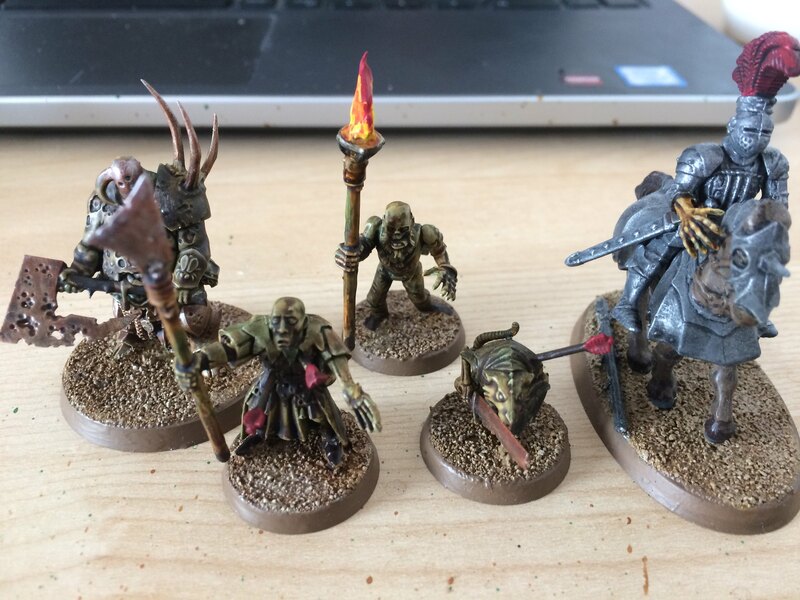 The Undead were my first love in Warhammer, and have been something I have been collecting since I was in primary school, so I’m very excited to finally be able to bring together a completed force that I can use. Age of Sigmar has given me that push to get something playable together and finally start exploring that side of the hobby. 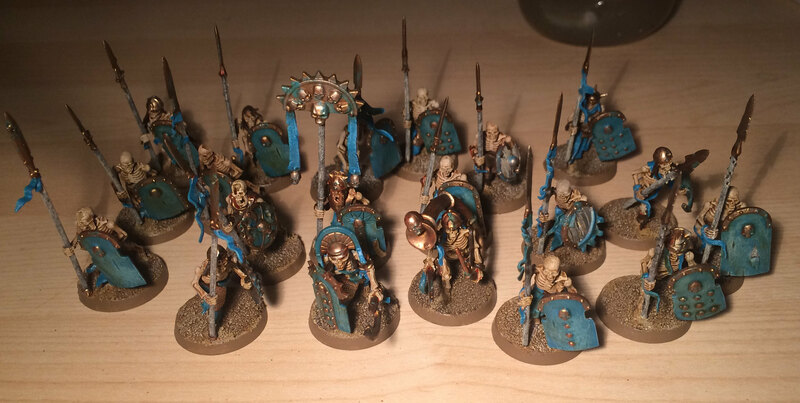 A unit of spear armed skeletons, I made and painted these guys from scratch rather than re-paint my older models, something I will do later. At the minute I have finished 20, but plan to add another 10. They will be joined by another 30, also with spears, and a spare command group in case I wanted to play them as three units of 20. 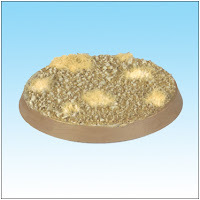 The bone is pretty simple, Zandri dust with a Seraphim Sepia wash. Followed by a drybrush of Praxeti white. Now I decided to add another wash of SS, because I felt the bone was far to white without it. 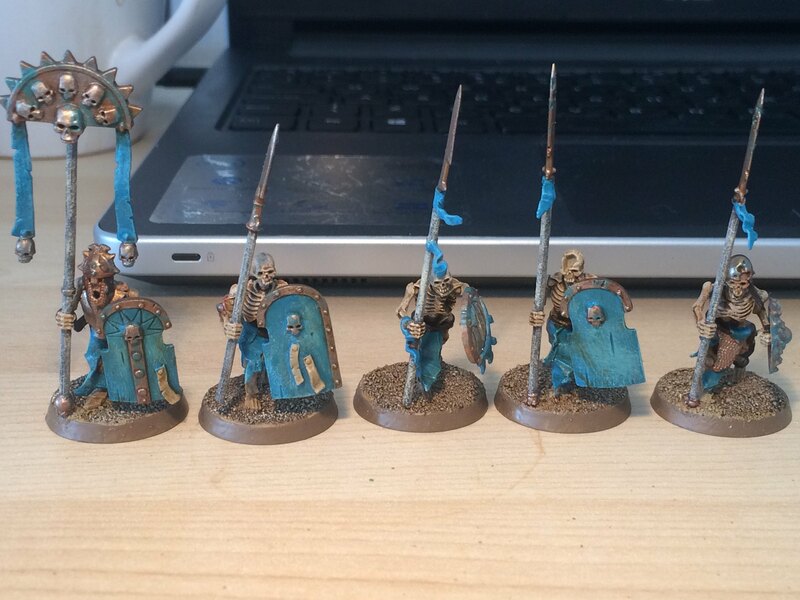 The Turquoise armour is actually from a necron painting tutorial, but I like it for an Egyptian blue colour. Sotek green with a skink blue and tyrant skull drybrush, followed by a wash of SS again. I love that wash.
For the metal, I use a screaming bell base followed by runelord brass. I also used a very watered down turquoise to oxide the metal, giving it that ancient look. Also washed with Sepia. Last edited by The Gunslinger; 09-20-17 at 11:44 AM. Looks good! Suitably vibrant colour for the turquoise, but still having that worn-out and used look. And the bone has that "left out in the sun for too long" -feel Good stuff! [Hyarion] Warning! Loran may cause addiction to mindless online games. Welcome to my second update, Rephalm’s Horde! 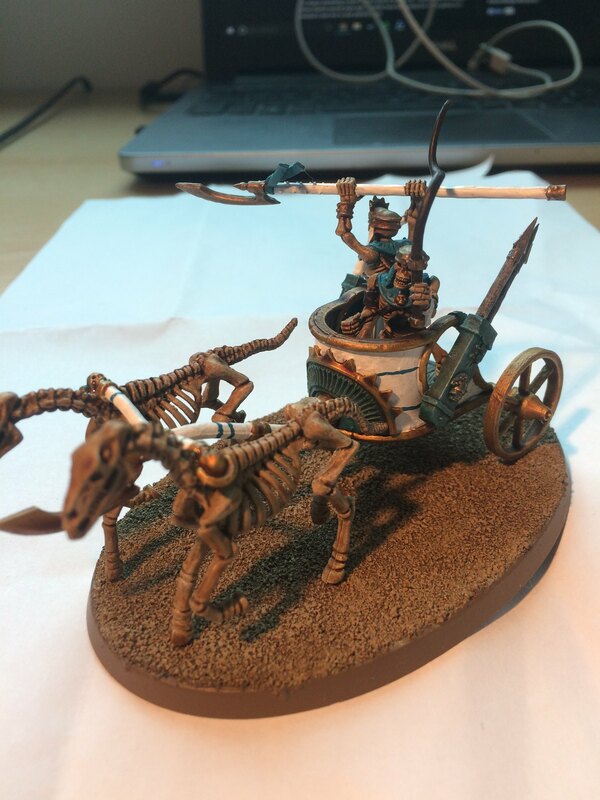 Rephalm is a wannabe necromancer, whose magic talent is incredibly slight, barely enough to keep the handful of zombies who pull his cart alive. He is one of the few “living” members of my force, and one of the few male characters. His story is tragic, a young, handsome noble who fell in love with Countess Verde, The stunningly beautiful leader of my army, many years ago. He attempted to court the countess, before learning of her vampiric nature. His infatuation grew to a deep obsession, as he stopped caring about anything other than her desires. This caused his physical appearance to degrade as he became more and more desperate to please her. Countess Verde enjoys the attention of men and treats those who fall under her spell as her playthings. Rephalm has since fallen from favour, having been cast out to care for the growing zombie horde that makes up the Countess’ army. Starting off at 20 models, my zombie horde will eventually be doubled to 40. But I didn’t love the idea of painting 40 plain zombies, so I have tried to introduce some variety to the unit by including some random models, I really like the look it gives to the unit. So I began with a white undercoat and then washed the whole model green, I used Biel-tan green because that’s what I had. 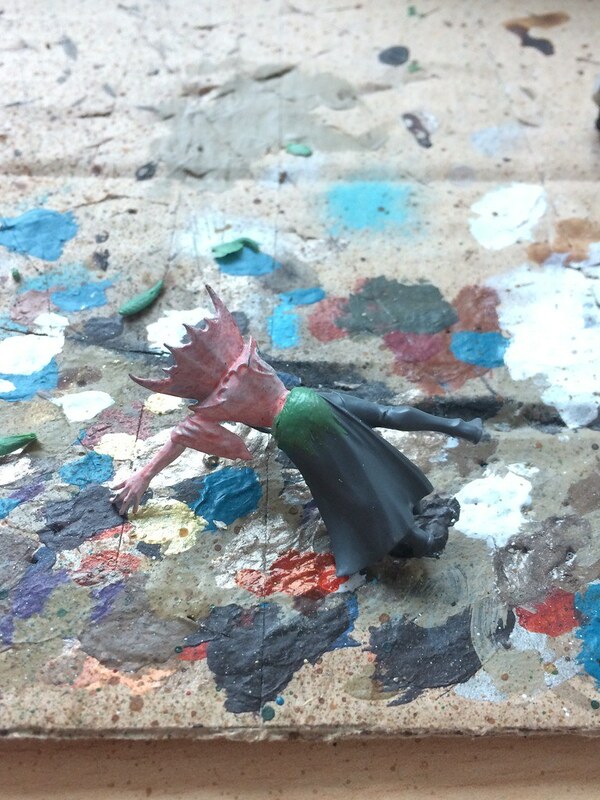 Then dry brush the model with a layer white paint, you want to cover more than a dry paint would, but not completely cover the green underneath. 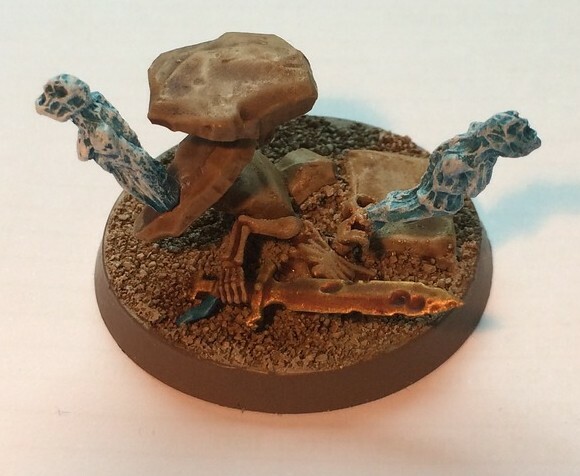 Paint the metallic parts a browny orange colour, like Vermin brown, and any detailed areas a dark green and dark brown, just to break up the model. Now use a black wash to give the model some detail, don't use it all over, but just to give definition to those deep areas. Then a brown wash all over the model, I used both seraphim sepia and devlan mud, but just go step by step until you are happy with it. 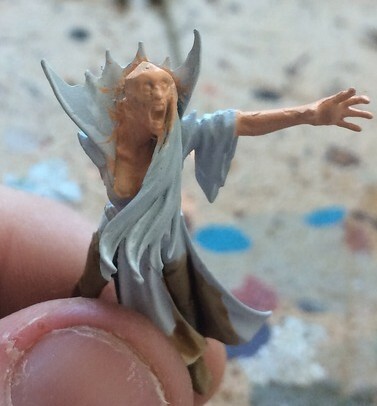 Now it is pretty much up to you, use whatever level of washes you want to give you a finished model. I ended up using another green wash on the skin to make it look more rotting, and like I said two brown washes before. Then I dry brushed some silver on the metal and blades. Paint any more detail you fancy, but for zombies, I was happy with the end result. Last edited by The Gunslinger; 09-20-17 at 12:05 PM. 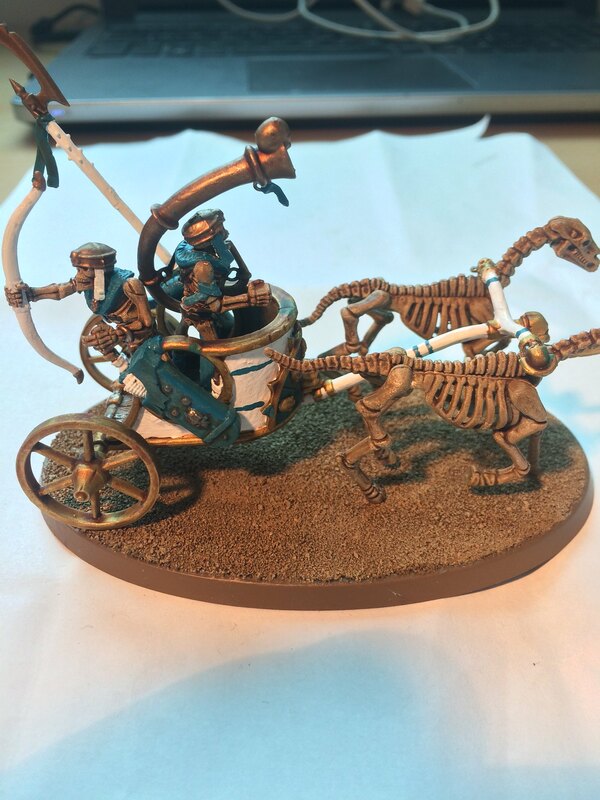 The mighty war chariot was a pinnacle part of the armies of Nehekhara and of the great city of Lahmia, so it stands to reason that there would be a group of charioteers that accompanied the Countess to war. They are deployed to cover the flanks of the Legion of Nehek, harrying the enemy before preparing for that devastating flanking charge. 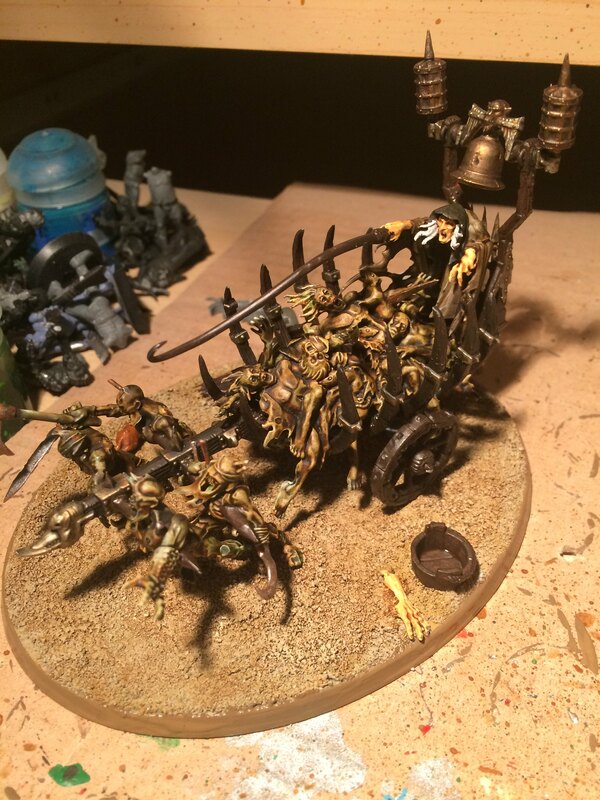 Much like the Legion of Nehek, the Chariots are inspired by the armies of the tomb kings. 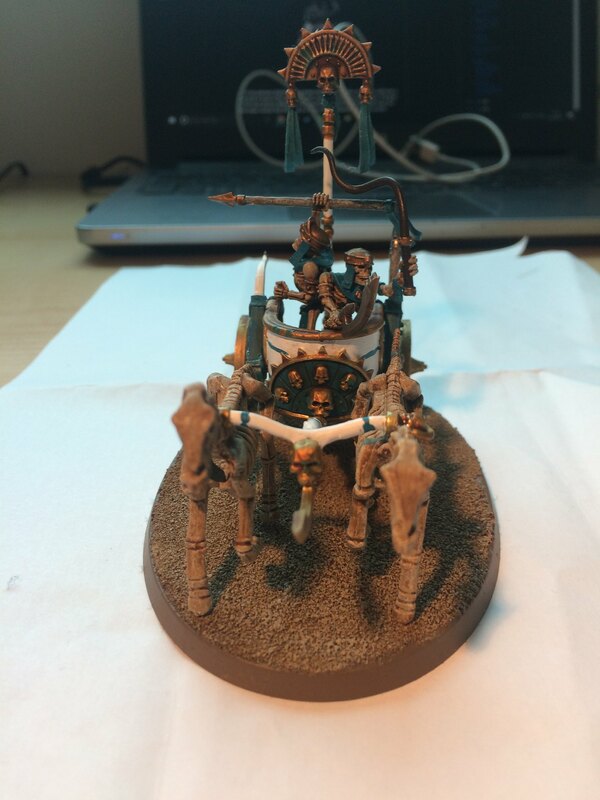 With white wood making up the chariot itself and detailed with turquoise to bind it with the rest of the army. I used a tarnished brass for the metal areas and my standard bone from before. I included a banner and a musician in the unit. 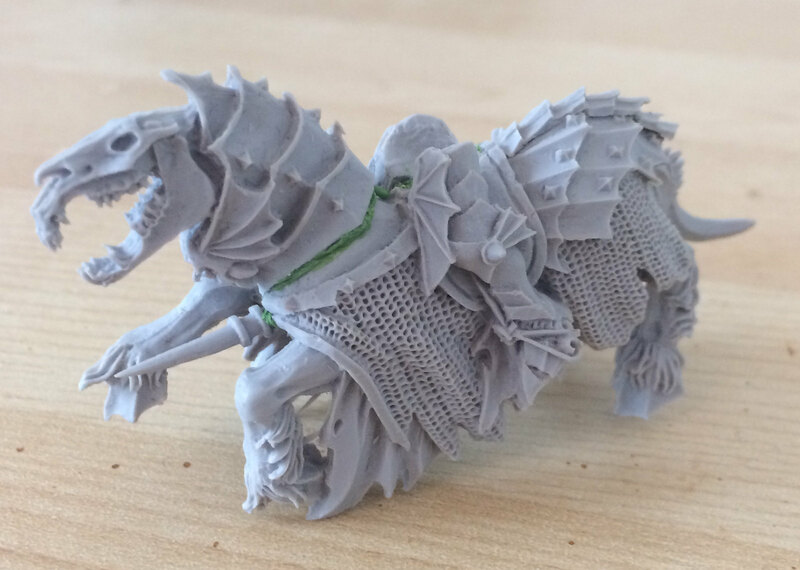 The banner can restore 1 model to the unit every hero phase and the Hornblower will make sure the unit can always charge 6” as well as being able to shoot and run in the same turn, something that is pretty essential for chariots. 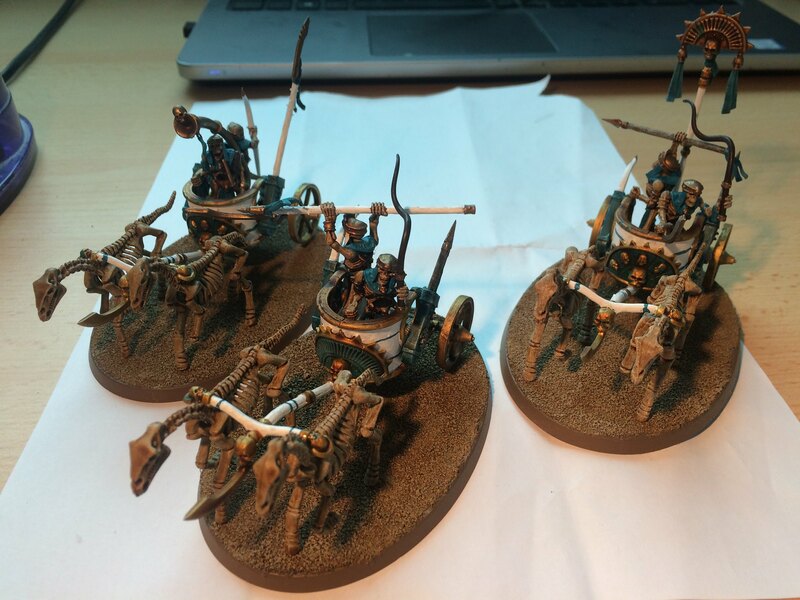 I might add another three chariots one day, if I can find some cheap on eBay, but for now, I think it’s a nice little unit which adds to my battleline requirements and looks great. Last edited by The Gunslinger; 09-20-17 at 12:09 PM. 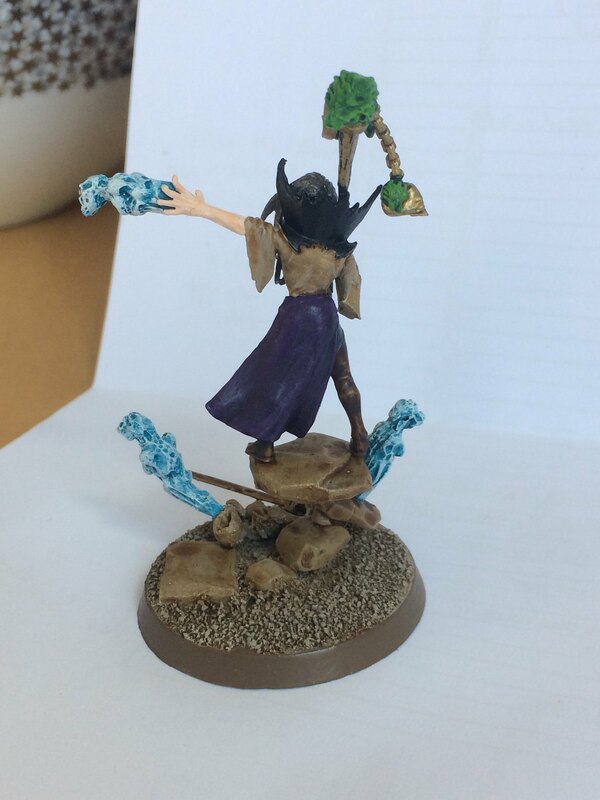 A small update today on what I’m working on, a female necromancer. 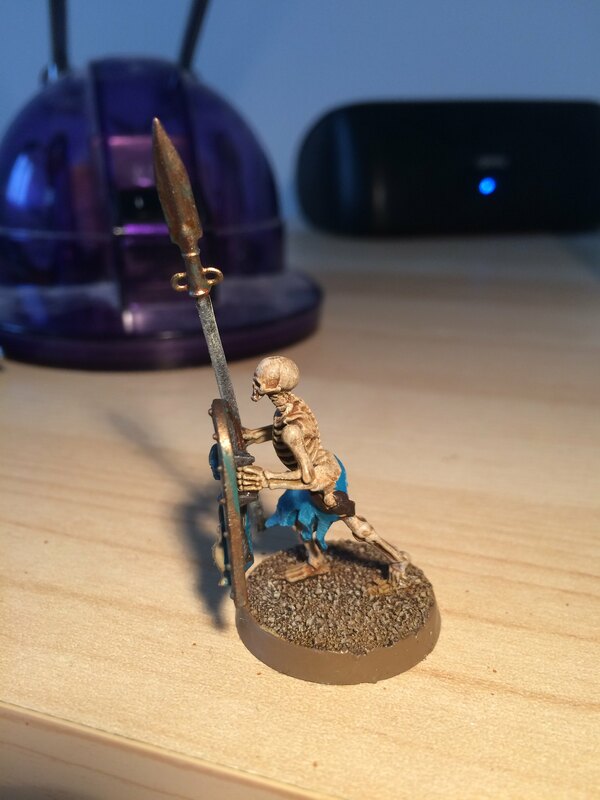 Now I like to try and make my characters look unique, and I already had one pathetic male model in my army so adding the standard necromancer seemed a bit boring. The backstory I have so far is she was a nobleman's young daughter, who fell into necromancy when he died and she lost her inheritance to another nobleman. She attempted to bring him back, which went about as well as you can expect so she fled and ended up in the court of Countess Verde. The Countess recognised the power of this young women and guided her, promising her the blood kiss if she does well. 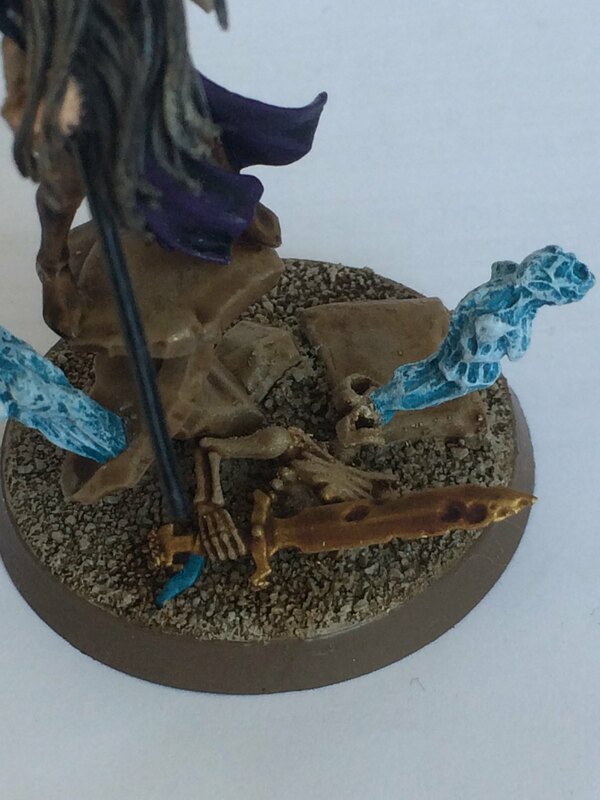 So the model is made up of the legs of a dark elf sorceress and the body of a banshee. I think I have managed to join the body ok, cutting away the more elf-like influences and using some greenstuff to extend the robes. My only concern is I may have out the body too far forward, giving her an oversized behind. I showed my girlfriend, who has a similar problem, and she thinks it’s ok. She is, after all, wearing boots and a corset, such things do over exaggerate your figure. Last edited by The Gunslinger; 09-20-17 at 12:14 PM. Great read. Worth a bookmark and subscribe. I look forward to seeing continued progress. Thanks! I appreciate that and I'm glad you are enjoying. Just a small update on my female necromancer, still need to think of a name for her. I hadn't realised that the banshee didn't have a nose, so I had to make her one out of greenstuff. Took some work but I think it looks ok. Sorry the photo isn't great quality. I have also made some progress on her base. Seeming a necromancer will most likely find her way into every list, I wanted her to look suitably impressive. I used the floating rocks from the high elf mage kit, and the spectres from Mannfred's cape. Last edited by The Gunslinger; 09-20-17 at 12:15 PM. Mara was a young woman who had everything. Her father was a power noble who demanded the respect and admiration of his peers. However, one day he died suddenly and his rivals moved quickly, seizing his lands and wealth, leaving Mara with nothing. The young, naive women panicked, and in desperation resorted to necromancy in an attempt to bring her father back. Using an evil text found in her father’s great library, she uttered the words within over her father’s corpse. Unfortunately for Mara, and the town, her words affected more than just her father's corpse, all the dead from the town’s graveyard began to rise and attacked the townsfolk. Mara realised the newly risen dead would not follow her commands when her deceased father turned on her. She barely managed to escape and fled the town during the confusion. Eventually, Mara found her way to the court of Countess Verde and pledged her services to the countess. Realising the natural talent of her latest follower, the countess tutored Mara in the dark art of necromancy until she became one of her most powerful spellcasters. I wanted Mara to be a centrepiece in my army, as I think she will always be included. 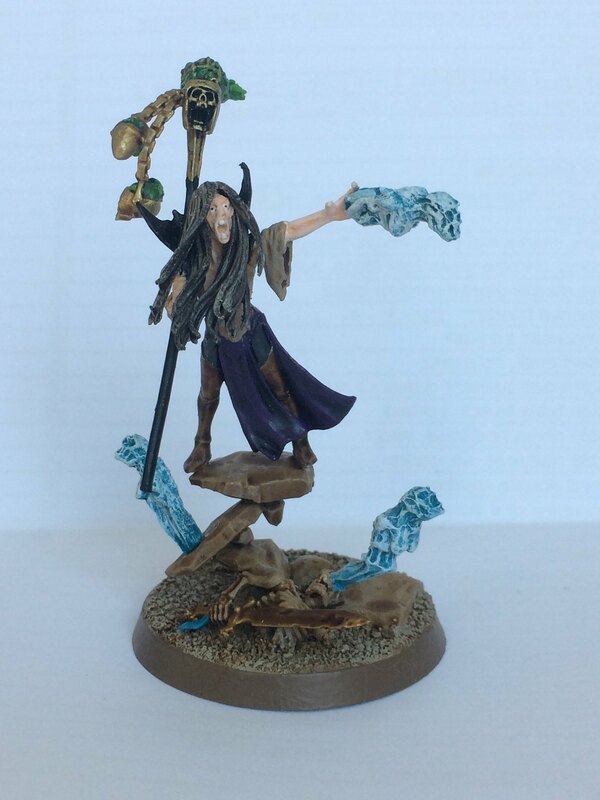 I knew I wanted a female necromancer from the start and wanted to move away from the pathetic looking wretch and instead create a powerful female spellcaster. 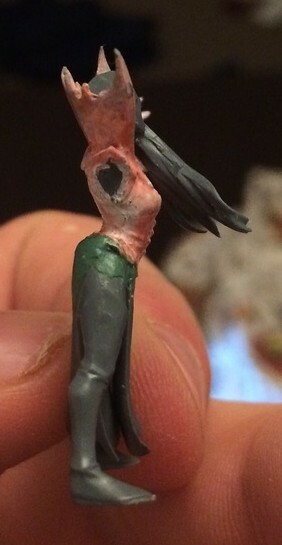 The legs are from the dark elf sorceress and the body is from a banshee. The staff is made up of a lance and head from the hex wraith kit. I wanted reasonably plain clothes for her, so a linen blouse, purple skirt and plain leather boots. Last edited by The Gunslinger; 09-20-17 at 12:30 PM. 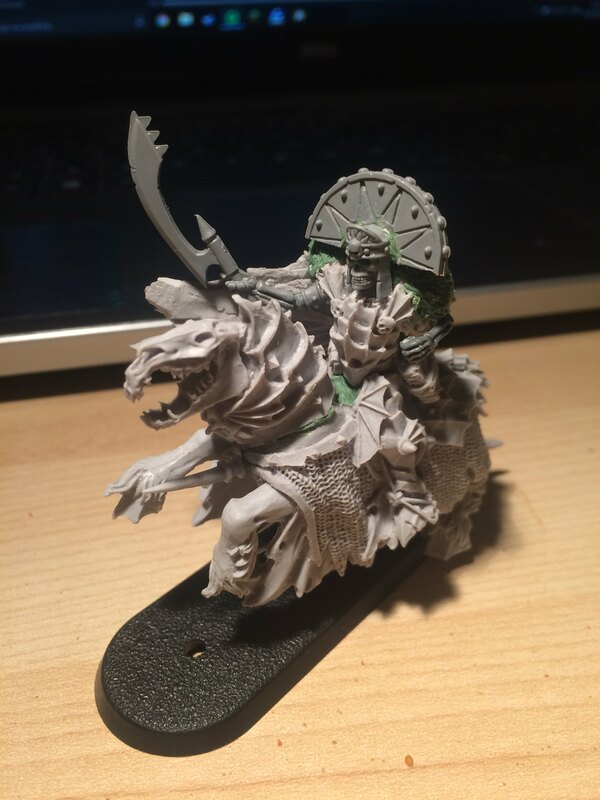 Whilst I work on a back story and take some better quality pictures of my mounted Wight King I thought I would make a quick post showing how I made him. 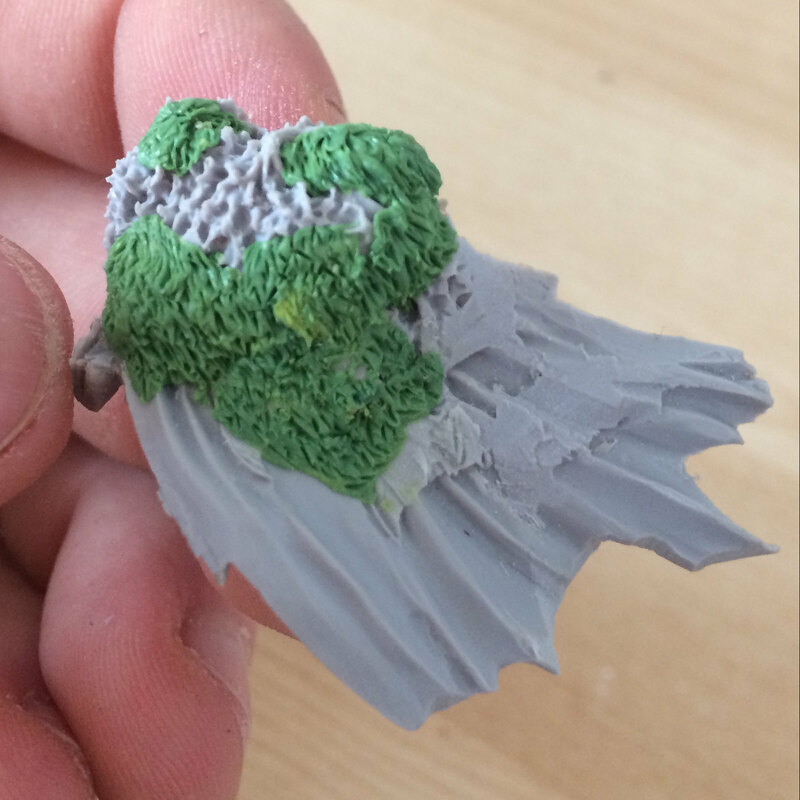 I then tried to remove the bats on his cape, very fitting for a vampire, not so much for a wight king. To cover up the mess I made I green stuffed some more fur onto his cape, to match what was there. 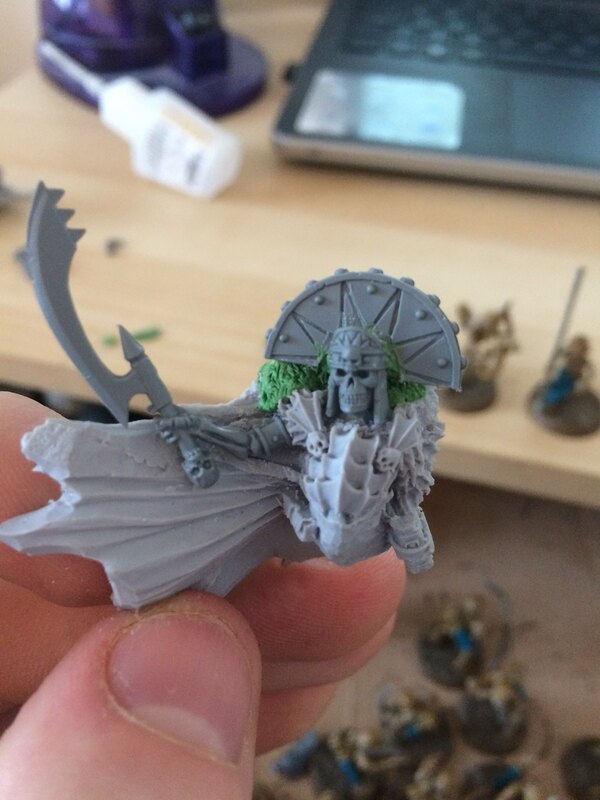 I wanted my Wight King to fit the in with the Tomb Kings vibe my army is going for so I gave him a suitable crown. 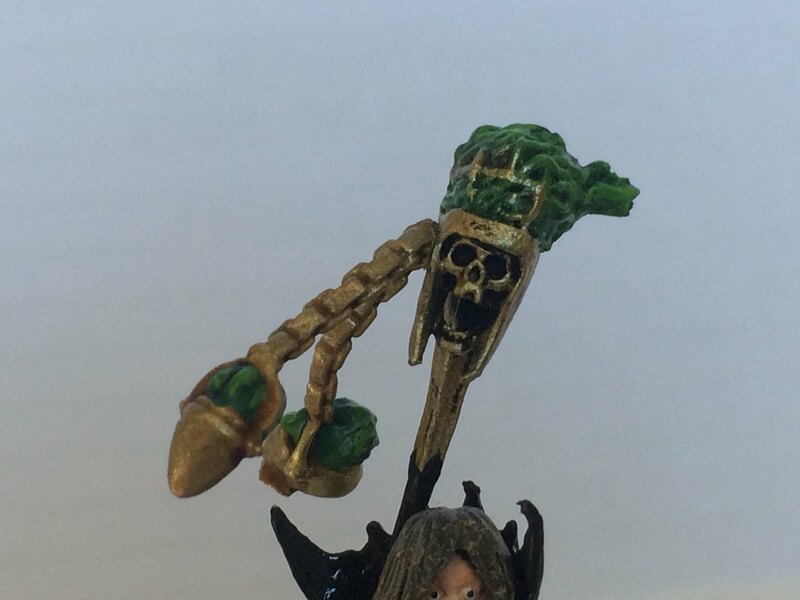 I used a tomb kings skeleton’s head fitted inside a banner to create a crown. I had to use some more green stuff to give him a fur collar to cover up the mess left over from the old head. And a suitably cool-looking sword arm, from the Tomb Kings skeleton set, fit perfectly. I used a regular skeleton’s shield arm for his left arm and again I had to hide where I removed Mannfred's arm before with some more greenstuff. I used a tomb king's shield for him, but I didn’t attach it until I finished painting. I then finally attached him to his mighty steed, tidied up the joint and started painting. Last edited by The Gunslinger; 09-20-17 at 12:37 PM.